Bleddyn Williams was an inspirational former Wales captain, often referred to as "the Prince of centres". He played schoolboy rugby for Wales in 1937 before being recommended for a sporting scholarship to Rydal School in Colwyn Bay by legendary Welsh rugby player and cricketer Wilf Wooller. 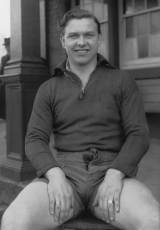 During the 1938-39 season Williams turned out for Cardiff Athletic, at fly-half, before the outbreak of war saw him join the RAF and serve in Europe. It was during the war that Williams joined Cardiff RFC and switched his position to centre. Alongside Dr Jack Matthews in the Cardiff centre, Williams became the lynchpin for a great Cardiff side. His inspirational demeanour and hard hitting tackling ability were married to superb line-breaking running angles. Williams won 22 caps for Wales between 1947 and 1955, including five victorious runs as captain. Williams also captained the 1950 British and Irish Lions on their tour of New Zealand, although his side could only record a draw and two losses. The following season however, Williams and the Lions defeated Australia in two Test matches. Williams crossed for a try in the 19-6 first Test win at the Wooloongabba. His finest hour in a Wales jersey was skippering his side to a 13-8 win over the touring All Blacks in 1953 at the National Stadium. This remains the last victory secured by a Welsh side over New Zealand. He was also the captain of the Cardiff side that defeated the All Blacks several weeks earlier, providing a unique double for a Welsh captain.